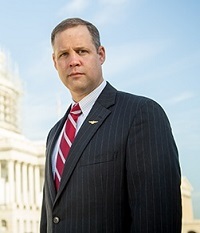 The Senate Committee on Commerce, Science and Transportation approved the nomination of Rep. Jim Bridenstine (R-OK) to serve as NASA administrator by a party-line vote of 14-13 this morning. Republicans voted for Bridenstine while Democrats opposed him. The nomination now goes to the full Senate where Republicans hold a 52-48 advantage at a date to be determined. During a contentious hearing last Wednesday, Democrats had criticized the former fighter pilot turned politician as lacking the scientific and technical expertise to lead the space agency. They also questioned whether the deeply conservative Republican was too partisan to lead NASA. Democrats were critical of his positions on climate change and LGBT rights. Republicans praised Bridenstine’s service in the House, where he had become one of Congress’s leading policy wonks. The Congressman has the support of a number of space organizations as well as Apollo 11 astronaut Buzz Aldrin. The position of administrator is one of two positions at NASA that require Senate approval. The Trump Administration has yet to nominate a deputy administrator. Did anyone expect it would be otherwise? How many times in the past has the vote on a NASA administrator been a partisan issue? I can’t think of any, and my memory goes back to a time before NASA began. I hate to sound like Donald Trump, but …. SAD.